On the same weekend as ROCstock in November of 2015, a boy scout leader died from injuries sustained when he was hit by a model rocket. 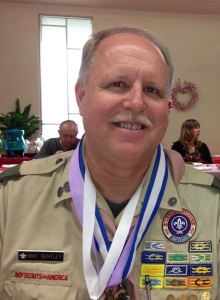 Mike Bentley was a long time scout leader, and a family man. He is survived by his wife and four sons. He had lost track of the rocket, which came in ballistic and struck him in the face as he was looking for it. It was not a high power rocket, but what we think of as “mid-power”. It was launched by another adult at the annual “Rocket Rave” event hosted by the local Boy Scouts of America council. Mike was one of the organizers of the event, and had done so for several years. The accident took place in Johnson Valley, about 25 miles east of the ROCstock launch site. We at ROC were stunned by the news. So far as we can tell, this is the only fatality at an organized launch in the 60+ year history of model rocketry. Even small rockets can have a great deal of kinetic energy, and if they strike anyone at high velocity can be very dangerous. Of course, the risk increases with the mass of the rocket, but even small rockets should be launched at an appropriate location, under safe conditions, and with precautions taken to minimize risk of injury. This is one of the central reasons ROC exists–to provide a safe launch environment. But all the rules and guidelines only help when they are actively applied. Among the changes we have instituted, and are still working to improve, include ensuring that rockets are angled downrange during launch, so a ballistic recovery will only hit empty lakebed. We have also clarified some of the roles and responsibilities of volunteers conducting a launch. Recently we have been using an additional “head-ups” horn at the LCO table to get everyone’s attention if a rocket is coming down over the safety zone or spectator areas. We have also clarified that if rockets consistently fly over the safety zone or spectator areas, the launch is to be suspended until we can ensure safe flight paths. If we can’t launch safely for any reason, the launch will be cancelled. In addition to cooperating with all safety rules and instruction during a launch, it is especially important that everyone stay aware of rockets being launched and recovered, and if anyone yells “HEADS UP!” stop what you are doing an pay attention to the rocket that may be flying toward you! Please join us in remembering Mike Bentley, and in doing what we can to make sure no one is injured at our launches!